How did you come to work on the project? It was a bit of a bolt from the blue - I was approached by the Fleming estate through my agent in December 2012 and asked if I would be interested in writing a new set of Young Bond novels. As you can imagine, I didn't have to think about that for long! I wasn't up against anyone else but I did have to demonstrate how I'd tackle the project with a synopsis and some sample chapters. Then I met with the Fleming board in person to discuss and take on board their comments. Final go-ahead came soon after - the word came through while I was staying in a hotel in New York, which felt suitably Bondian. 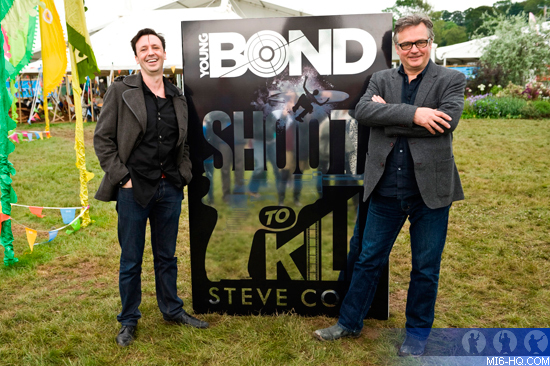 Above: Charlie Higson (right) officially hands over the mantel of Young Bond author at Hay Festival earlier this year. How difficult has it been to craft a novel, in an already populated 'universe', where so many of the facts and rules are settled? Well, I have form in this regard having populated my own fictional universes with facts and rules via my younger series fiction. I find having some strictures to work within can enhance creativity. How much freedom where you given by IFP? How did this influence the shape the story? Did you have to follow on from Charlie or could you have made the character contemporary? It was always going to be a period piece; the historical setting is a point of difference and style that helps make Young Bond stand out from other young adult thrillers in the market. As for freedom of plot, I was simply asked to come up with ideas, which would then go to the Fleming board for discussion and approval. I met up with Corinne and Jo from IFP in December 2012 and pitched the Hollywood setting and title, then set about writing up my ideas over Christmas and New Year into a very detailed synopsis. What has been the most trying aspect of writing this novel? The story was balanced by several strong female characters, such as 'Tori.' Had you planned this? Yes, that was very high on my agenda with the book. There is very little written about Bond mid school years, have you mapped out the key beats of your story arc or will you be writing each book independently? I have a broad plan for what will happen, although ideas suggest themselves when writing, so flexibility is important. Filming acts of violence is something that unfortunately is being seen more often today, when conceiving the story device did you expect your novel to imitate life so readily? Not really, no. But I wanted to take something teens would understand and relate to - so much of their world involves visual snatches, like Instagram and Vine, and so I thought I would give it a Young Bond twist. Your Bond is starting to develop harder edges and trust issues in this novel - will these themes be continued in your series? How do you feel about the brutality of the character, particular in a young adult novel? My take on Young Bond is that these adventures are pushing him along the road that will lead to his professional future, so these issues will need to be addressed. I think all teens have similar issues, and they aren't always resolved prettily. Have you included any personal references in the book? I've tried not to indulge myself! Can you tell us a little about rejected titles and cover ideas? Did you need to perform any major edits to the story? If so what did you find hardest to cut? 'Shoot to Kill' was always the title, right from the start - the 'shooting movies/shooting guns' connection worked and it just felt quite Bondian. The cover originally had more stylistic elements in the type, like incorporating LA's City Hall into the H of 'SHOOT.' As for edits, they weren't too painful. 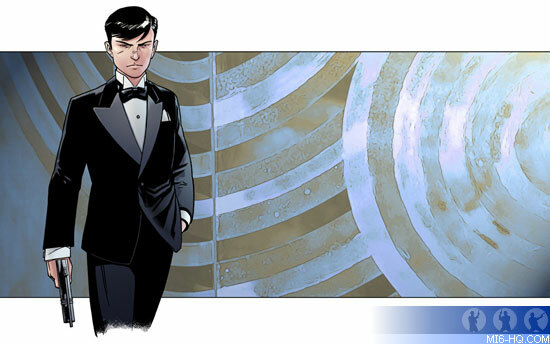 The main note was to lose a character to make the narrative run cleaner and sharper. That meant ascribing different motives to existing characters in order to preserve the shape of the story, which was a fun challenge and improved the book into the bargain. Many thanks to Steve Cole. "Shoot To Kill" is now available to order from Amazon UK.